“What is the kingdom of God like? And to what shall I compare it? It is like a mustard seed, which a man took and put in his garden; and it grew and became a large tree, and the birds of the air nested in its branches” (Luke 13:18-19, NKJV). 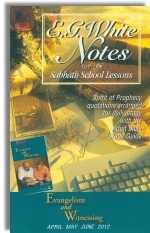 In Sabbath afternoon’s lesson, the author contends that everyone in the church, young and experienced alike, should take their role as a witness for Jesus very seriously. 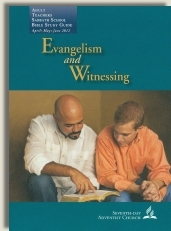 Judging from the information presented in the previous weeks in this quarter and from Adventist teachings in general, it is clear that by the term 'witnessing’, the author intends to convey the concept of persuading individuals to join the Adventist denomination. A practicing Adventist approaches 'witnessing’ very differently than a non-Adventist Christian would. So, we can safely assume that by the term 'witnessing’, the author does not mean the Gospel proper, as delineated in Scripture above—but rather the Adventist brand of the 'gospel’, which involves several distinctive rules/details that are unique to their denomination. Personally, being raised as an Adventist preachers kid (PK), I knew much better how to 'witness’ to Christians (by telling them why they need to keep the Sabbath) than I knew how to give evidence to non-Christians for the One Who died, was buried, and raised for their salvation. When I was Adventist, I did not know that Jesus kept the law on my behalf, and imputed His righteousness to me as if I had done it. I did not know that God has graciously given us so much evidence of Jesus’ identity, so that we could know that He truly is the One He claimed to be. As an Adventist, I could articulate the evidence of the validity of the Shadow (the Sabbath—see Colossians 2:17-18) but not for the Substance.